Make your own healthy crockpot granola recipe at home. 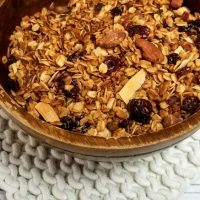 This slow cooker granola recipe is gluten free and vegan free, too, making it an allergy friendly recipe. Spray the bottom and sides of your Crock-Pot with cooking spray. Add the oats, nuts, chia seeds, cinnamon, and salt. Stir to combine the ingredients. In a small bowl, stir together the oil, Agave, and vanilla. Then, pour over the dry ingredients in the Crock-Pot and stir until coated evenly. Place the Crock-Pot lid on slightly ajar to leave a little room for steam. This will keep your granola from getting soggy. Cook on high for 2 ½ hours, stirring occasionally. Once the oats look golden brown and feel dry, turn off the Crock-Pot and mix in the cranberries, coconut and cacao nibs. Pour the granola onto a cooking sheet and spread out evenly to cool. This will let your granola get nice and crispy. Once the granola is completely cooled you can enjoy it right away or store it in an airtight container in the refrigerator. It will keep for about a week.